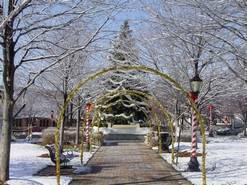 1) Tree Lighting Ceremony- Friday Dec. 2nd, 4-6pm in Metropolitan Square. Festivities include music from Salvation Army Band and Maine West Band and Choraliers and dancing entertainment from Artistry in Motion. Refreshments will be served during a holiday family movie at the Des Plaines Theater. Also, Santa will be arriving on a fire truck at 4:15pm. 2) Winter Wonderland Festival- Saturday Dec. 1st and Sunday Dec. 2nd, 10am-4pm. Bring your family and enjoy food, entertainment, music, arts & crafts and more. Special guest appearances by Ronald McDonald, Jewels the Clown, Kiwi the Clown and Sky Guy.